Young's modulus is the ratio of tensile stress to tensile strain. This ScienceStruck post explains how to calculate Young's modulus, and its relation to temperature changes and Hooke's Law. Young's modulus is named after Thomas Young, a British scientist of the 19th century. The property of a material of returning to its original shape and size after being put through elongation or compression is called elasticity in physics. In other words, it is the property of a material to resist deformation. This is contrary to popular belief that if a material can be stretched more than others, then it is elastic. So for this reason, a metal rod is more elastic than rubber. A metal rod can better regain its previous shape after the deforming forces are removed as compared to rubber. A material can be deformed along many directions. When a material resists stretching or compression in a linear direction, it is said to exhibit tensile elasticity. A measure of this tensile elasticity is given by the Young's modulus. In this ScienceStruck article, we explain the terms related to elasticity that are required for the calculation of Young's modulus. We also explain how Young's modulus varies with temperature and its relation with Hooke's Law. ✦ When a body is compressed or elongated by applying a force, there arise internal restoring forces in the body which oppose this change in its shape. ✦ The internal restoring force per unit cross-sectional area of a body is defined as stress. ✦ It is equal to the external deforming force per unit area applied to a body. Thus, unit of stress is same as the unit of pressure. ✦ When a body undergoes elongation or compression, there occurs a change in the shape of the body. ✦ The change in shape of a body because of an external deforming force is called strain. ✦ Strain is, thus, a ratio of change in length to the original length. ✦ Unit of strain: Strain has no units; it is a dimensionless quantity as it is a ratio of two lengths measured in the same unit. 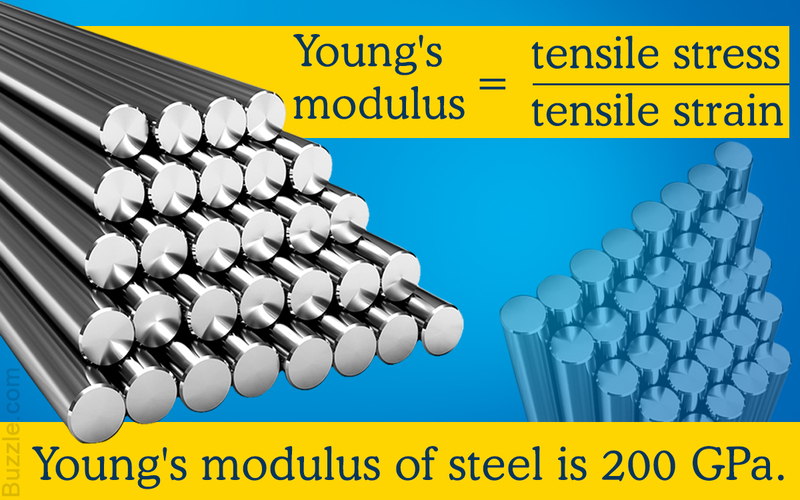 ✦ Young's modulus is the modulus of tensile elasticity. ✦ Tensile elasticity indicates the ability of a body to undergo linear deformation. ✦ A body undergoes linear deformation when it is stretched or compressed along a longitudinal axis. Young's modulus is given by the ratio of tensile stress to tensile strain. ✦ SI unit of Young's Modulus: unit of stress/unit of strain. Unit of stress is Pascal and strain is a dimensionless quantity. Hence, the unit of Young's modulus is also Pascal. Practically, MPa (megapascal), i.e., N/mm2, or GPa (gigapascal), i.e., kN/mm2, are the units used. For e.g. Young's modulus of steel is 200 x 109 GPa. When the temperature of a material changes, there is a corresponding change in the atomic thermal vibrations of the material. For e.g. When there is an increase in the temperature, the atomic thermal vibrations of the material also increase. So there will be a corresponding change in the internal restoring forces of a material when it is subjected to stress. The volume of material also changes when temperature varies. Hence, the strain exhibited by a material will also change. Thus, as the Young's modulus is the ratio of tensile stress to tensile strain, it will also vary with respect to temperature. Wachtman has proposed an empirical formula that shows the dependency of Young's modulus on temperature. • B is parameter depending on the property of the material. It is slope of the curve drawn of Young's modulus vs. temperature. It is related to the Grüneisen constant γ. • Exp (-Tm/T) is a single Boltzmann factor. • Tm is a parameter that depends on the property of the material that has a correlation with the Debye temperature Θ. • γ and Θ are the factors related to volume thermal expansion and the specific heat of the material, respectively. Hooke's Law states that the stretching that a spring undergoes is proportional to the force applied to it. Where F is the force applied, X is the displacement (extension or compression) produced in the spring, and k is the spring factor that is characteristic to the spring. This law holds true within the elastic limit. Thus, we can conclude that Young's modulus is the spring constant in Hooke's Law where length and cross-sectional area are 1. The displacement is considered to be longitudinal. Coming back to our comparison of elasticity of steel and rubber, let us understand it in terms of Young's modulus. For the same stress, the strain of steel is lesser as compared to that of rubber. Hence, the stress/strain ratio is higher for steel. In essence, the Young's modulus of steel is more than the Young's modulus of rubber. Thus, steel is more elastic than rubber!